Set in magnificent gardens just four miles from the centre of Cambridge, and a mere 60 minutes from London, Madingley Hall is easily accessible from the M11, A14 and A428, as well as Stansted, Heathrow, Luton and Gatwick airports. Built in the 16th century, this elegant country house is set within seven acres of spectacular gardens and grounds, designed in the 18th century by ‘Capability’ Brown. Our Scientific Program will take place in the Saloon in the main Hall which has a foyer to allow space for networking. Passengers travelling by train should alight at Cambridge railway station, which is located in Station Road. A full timetable information is available from the National Rail website. 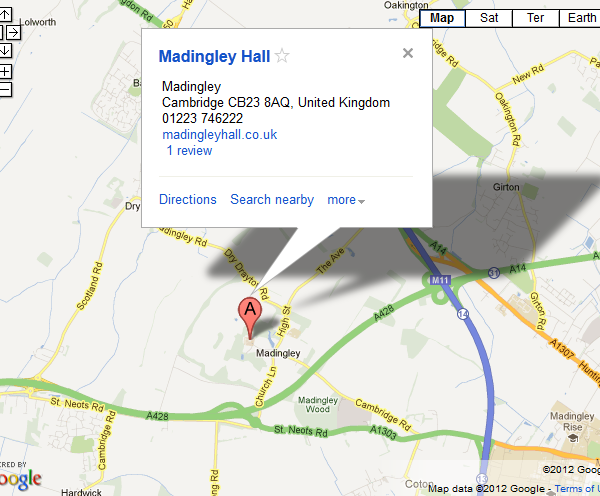 The quickest way to reach Madingley Hall from Cambridge is by taxi. You will find taxi ranks at both the coach and train stations. Madingley Hall are happy to recommend Panther Taxis. Call them free from a landline or public telephone on 0800 977 5761. Sat Nav users should use postcode CB23 8AQ. Although Madingley Hall is signposted from the A14, the route involves several difficult junctions. For a simpler route, leave the A14 just after Bar Hill at junction 30, signposted Dry Drayton. Once in Dry Drayton, turn left just before the church. At the T-junction in Madingley turn right, and continue past The Three Horseshoes public house, on your left. After 100m you will encounter a mini-roundabout: the Hall gates are on the right, opposite a left turn to Cambridge. Follow the A14 west to junction 31 where the A14 joins the A428. Take the first slip-road leading to the M11/A14, signed Huntingdon (not the second, signed M11). Follow the left-hand bend then move to the right-hand lane, signposted The Midlands (The North), Huntingdon A14. Immediately after re-joining the A14 take the first slip-road, signed Madingley 1 ½ miles. Continue past The Three Horseshoes public house on the left. After 100m you will encounter a mini-roundabout: the Hall gates are on the right, opposite a left turn to Cambridge. Leave the M11 at Junction 13, signed Bedford and Cambridge (A428/A1303). Turn left towards Bedford (A428), and after 400m turn right towards Madingley. Continue past the American Cemetery car park on the left. Drive through the village until you encounter a mini-roundabout: Madingley Hall will be directly in front of you. Travelling east on the A428, take the slip-road signed Cambridge and Madingley. At the roundabout turn left towards Madingley. You will see the Hall gates on the left, at a mini roundabout. Caution – the turn into the drive is sharp. From the Northampton Street/Queen’s Road/Madingley Road roundabout, take the Madingley Road (A1303) exit and travel west out of Cambridge. After the M11 junction take the right turn towards Madingley. Continue past the American Cemetery car park on the left. Drive through the village until you encounter a mini-roundabout: Madingley Hall will be directly in front of you. There is ample car parking at Madingley Hall. Cars may be left in front of the main Hall whilst registering but should then be moved to the rear car park. Please do not park in the cobbled courtyard except to unload luggage. Delegates with reduced mobility should park in the signed disabled parking area at the front of the Hall and enter the building through the front door. Wheelchair users may take their vehicle through the car park and into the cobbled courtyard. A ramp gives access to the large, oak, rear door and the reception area. Vehicles may be parked in the courtyard for the duration of your stay and you will be advised on parking position upon arrival.